Oglebay is truly a golfer's paradise, featuring 36 holes of championship golf at the Speidel Golf Club! The newest championship course, opening in 2000, is a modern links layout designed by Arnold Palmer and our classic Robert Trent Jones, Sr. designed championship course continues to be one of West Virginia's premier layouts. During the lazy summer days when long hours of daylight allow for a second, or even a third round of golf, Oglebay's 36 holes will provide enough challenges and spectacular scenery to please the most discriminating golfer! A practice range at the Speidel Golf Club features grass tees, matted tees, and a chipping green surrounded by two sand bunkers. Before and after your game, stop in the Hamm Clubhouse featuring a grill room, modern locker facilities, on-staff pro and a fully-stocked pro shop. 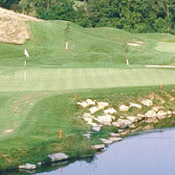 Additional golf amenities at Oglebay include the 18-hole Crispin Golf Course, an 18-hole Par III course and driving range.